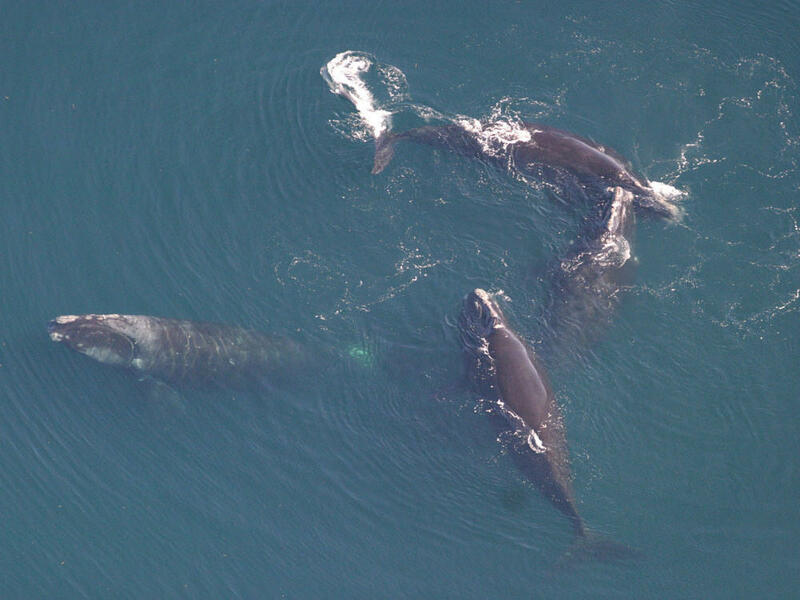 Four North Atlantic right whales, seen in April of 2008. The North Atlantic right whale is the most endangered large whale species on Earth. The principal cause of right whale fatalities is entanglement with fishing gear, including lobster trap lines. Scientists at the Woods Hole Oceanographic Institution say new technology could stop these ensnarements, but some lobstermen say the cost of adopting the new gear would be prohibitive. Woods Hole Director Michael Moore says the right whale is really in trouble, and something has to be done to stop entanglements. “It’s only going to get worse — if the right whale trajectory continues, the breeding females are going to be gone in 20 years, there’s only about 100 of them left right now and we’re losing about four every year, so as the public becomes more aware of the problem, the calls for a more draconian process is only going to get worse,” he says. At least 18 North Atlantic right whales were found dead last year, including 12 in Canadian waters that showed evidence of blunt force trauma from ships or fishing gear. Moore says new lobster fishing technology could eliminate the need for ropes that connect traps on the ocean floor with buoys at the surface. He says instead, traps can be equipped with remote-controlled flotation devices that could be inflated to bring the traps to the water’s surface. Moore acknowledges that while the ropeless traps would be initially expensive, the price would drop over time and would be preferable to closing lobster fishing grounds to protect the whales. Dave Cousens, president of the Maine Lobstermen’s Association, says ropeless trap prototypes cost thousands of dollars per trap, and he doesn’t envision Maine lobstermen going tetherless anytime soon. Cousens says an equipment failure with the ropeless system would leave traps on the bottom without any means of retrieving them. Officials at the National Oceanic and Atmospheric Administration are reviewing the status of ropeless traps and could recommend the use of the technology to improve the prospects for right whales. This story was originally published Feb. 20, 2018 at 8:26 a.m. ET.